Lift and Dump Up to 16 Cubic Feet of Debris in Seconds. The 16 cubic foot collection bin mounts to the rear of 4000 series tractors. 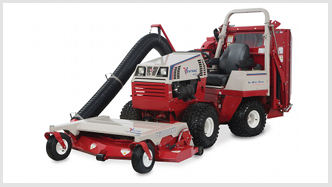 The vacuum/blower system powered by a dedicated 10HP Vanguard engine with electric start. The high lift mechanism – hydraulically raise the collection bin up to 60″ and dump to unload the contents into a garbage bin or trailer. 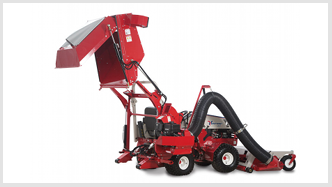 A one-person mower, leaf and grass vacuum, debris collector, and debris loader. 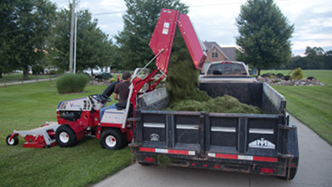 The vacuum pulls in grass, leaves, and debris as your operator mows, then stores it in the 16 cubic foot collection bin. Next step: Back it all up to a trailer bed or garbage bin and dump the load. The high lift raises in just five seconds and can lift 300 pounds. 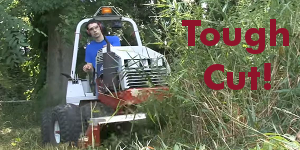 What about vacuuming leaves and debris in non-mow areas? Use the vacuum manually with its handy hand-holds. Want a demo? Call us at 612-333-3487 or fill out the form on this page.Looking for financing? Click here. 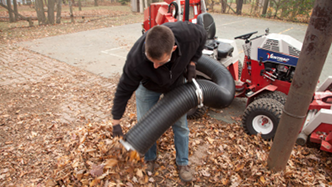 Click each leaf and debris vacuum collection system image below for more details.